Hoskia India Review 2019: Is Hoskia India a Good Hosting? Relatively young hosting company Hoskia India offers inexpensive Linux and Windows hosting services for everyone from startups to large scale businesses. 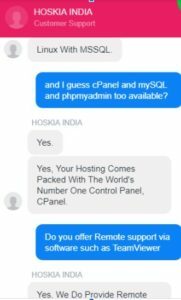 Hoskia India (unsurprisingly) is an Indian hosting company based in Thrissur, Kerala. 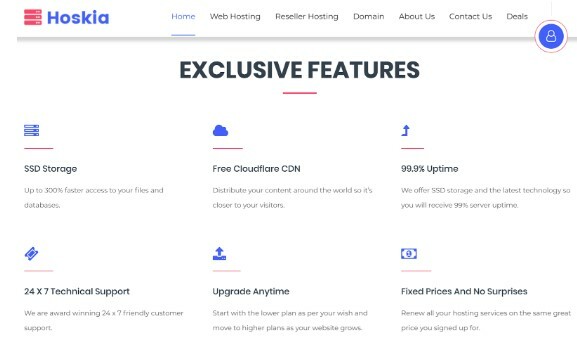 It was founded relatively recently in May 2018, to offer a range of affordably-priced web hosting, reseller hosting, VPS, and dedicated server solutions along with domain services and SSL certificates. According to the metrics published on its attractive English-language website, Hoskia India has registered more than 3,000 domains, completed more than 400 projects, pleased almost 300 happy clients, and won 850 awards in the short time since it was set up. Hoskia India offers three shared web hosting plans that appear to provide the same features but different data allowances of 10 GB to unlimited SSD storage. Since the company offers easy upgrades at any time, you can start with a lower plan and move to a higher plan as your website grows. SSD storage (for faster data read/write speeds) and Cloudflare CDN (for local content caching) combine to ensure faster page loading. You also get to enjoy 99.9% uptime. Comodo cWatch provides 360-degree website security that combines automatic malware removal tools with “patent pending” scans to provide customers with robust and reliable website protection. Additional pay-for add-ons include sitemap generation, search engine submission, Google analytics integration, Google webmaster account and site verification, and Facebook business page setup. When you’re ready to scale up from shared hosting, Hoskia India can also offer you three business hosting plans, three reseller hosting plans, 18 dedicated server plans, and 18 VPS plans. Hoskia India’s plans are pretty cheap. You can pay for them on various billing cycles from monthly to biennially, and by multiple methods including credit/debit cards, PayPal, Paytm, and various mobile wallets. Note that you don’t get a discount for a longer-term commitment, but you do get free backups, a free SSL certificate, free website migration, and a 30-day money-back guarantee on some plans. Hoskia India’s 24/7 customer support team can be contacted by telephone, ticket, email, online form or live chat. I tried the live chat twice, and my questions were answered promptly and satisfactorily each time. Hoskia India provides a useful FAQ section that should answer some common questions, and a knowledge base containing several tutorial-style informative posts for additional self-support. onClick="trackClickout('event', 'clickout', 'Vendor Page - Visit User Reviews', 'Hoskia India', this, true);"
This is the best hosting ever. I am using their hosting since last 2 months, their support is the best, they reply just under few mins and staff is very friendly . I am Hosting 10 sites their best SSD ever had no issue since now, would recommend this to everyone. If you need cheap yet reliable hosting plans to meet personal, small business, or enterprise-level needs, then Hoskia India is definitely worth adding to your list of likely hosts. Check out Hoskia India’s inexpensive hosting plans. Wondering how Hoskia India stacks up against other Web Hosting companies? Enter any other Web Hosting company and we will give you a side-by-side comparison.